Second Big wave is here.. low tide still late Jan.
Ok this is a quick summary of today's trade.. I will update today and over weekend and include Timecycle Chart which this trade is linked to.. This is my daily tracking chart. We added 20% Short @ 51.28, will add more if we fail the trend again or collapses below 50.7x. Trade active: Added DRIP and SCO as new vehicles for shorts. 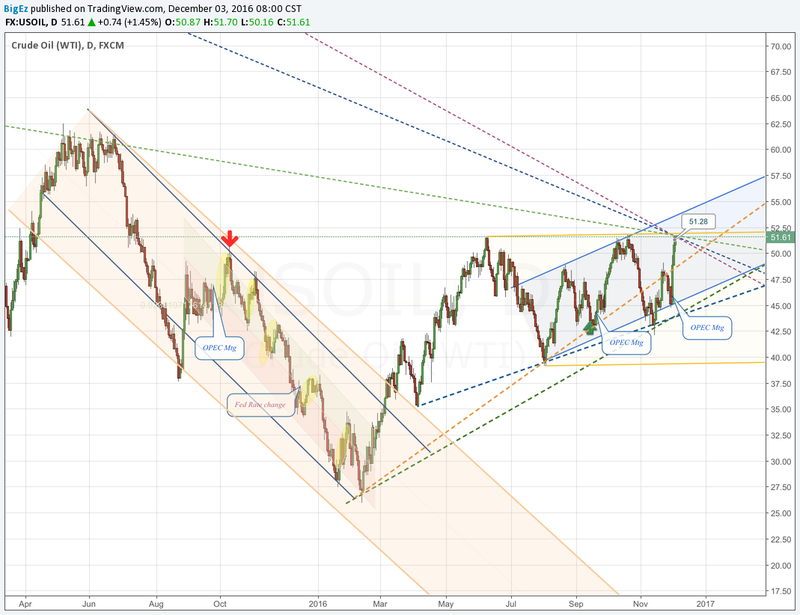 This will be a test of return/loss on wti price now that Dwti is gone. We are 25% short cash 75%. Updated; noisy.. but basicly Sine/TS pattern says price will be at its Low of cycle around Jan20th. That price will be below the cycle start date/price. (Oct 11th/51.56). Price can go higher than 51.56 but will be lower at end of cycle. Water fall effect is common. With +8% days a few times each cycle. .
Trade active: Rain & Winter in Houston 57°f ... dam, it was nicer in Hamburg. Anyway.. we dumped our shorts last week, and started these new shorts.. still based on Sine Timecycle. Here are a few from today.. Charts tell me the chance of a reversal here is more likely than a further bull run. It also prepares me for a run to near 55 worst case. But history shows that this level is hard to top. The longterm trends were just reset.. , like last time, they can be tested or rest again in a few days, but it has marked a top the last few years. The longterm trends show a decision point (pennnant/wedge) in the next few weeks/months. Depending on your timeline. Mine is mid-Jan.
Oil has averaged less than this for over 2 yrs, and we still managed to build inventories, increase rigs, and yes make money. History has also shown the result of OPEC meetings including the "historicly different" ones ...like last fall, have had an almost predictable result. For me it's a good bet to short, as each of these cycles reduce in amount until the big break. (mid Jan). We are 25% short. Hope to be 100% short by EIA. Just don't know timing yet. Ready to bail if really breaks up..way up. But short of a mushroom cloud, I don't see oil above 56'ish till next year... if then. I'm calling this the Hype cycle. The green boxes show the price action in the 24hrs Before Weekly EIA.... bullish. So we went Long @50.71. This is 24hr long on Pre-EIA hype cycle. Will close prior to Report. Closed longs, opened more shorts..
Ok, so the pre-EIA cycle failed... first time in 5 reports. But we did make money on GUST. Charts below show trade.. seems gust reacts slower, and not only same direction.. I am still looking for patterns in GUST. We also went Short at 50.03. 25% shorts added. Comment: Here is what I'm working on this morning... assuming the nopec news is positive... and we run through longterm trends, then it could go to 54.9x next week, worse case.. If it just sets new highs before EIA, around 53.0x then I think it returns to sub-50 quickly. Midterm, 4 to 6 weeks still very bearish.. fundamentals still say too much oil, even with real cuts. And a fail in S&P is not a crazy thought.. If the news as seen as blah,blah... we should see a fail and it could be a nic long fall.. be safe! Comment: NoOPEC gap went against us. But we play the long game, still looking to be much lower come Jan 20th. While many are celebrating this bull run, I am looking for a place to put anouther short on the books. Next short may be the best of the year. Trade safe make money.. Ohh..Yes.. I do see $60... but not late January/February at the earliest. Last wave before low tide - Oil's 2016 highs are behind us. hi! nice pics) what d'you think about oct-nov 2017?